I’ve just come to the end of another lovely week in the Hepsibah Gallery, Hammersmith, London and thought I would quickly post my best wishes to you before I head off to spend Christmas with family across the pond next week. I would like to thank you all for your support in 2018 – it means so much to me. So, as the website is under construction, I have no idea how to add an image to this post!! It just remains for me to wish you and yours the warmest, loveliest Christmas and a productive 2019.
https://pennygerman.com/wp-content/uploads/2019/03/Heading-in-Blue-ARBSA.png 0 0 tessa https://pennygerman.com/wp-content/uploads/2019/03/Heading-in-Blue-ARBSA.png tessa2018-12-13 17:44:182019-01-08 14:54:23Merry Christmas! Hi all. I thought I’d send you this photo of ‘Stan’ painted as a birthday commission. He’s a cute little terrier with a slightly bent front leg so don’t think I don’t know! I enjoyed painting him and his owner is delighted….phew! I wanted to let you know that I have packs of Christmas cards available. See below packs of 6 cards for £5.00 plus £2.00 p+p for up to four packs. If you’d like some do email me back as they’ll be here next week and I can send them out. So, what else have I been up to? Lots of painting, naturally and I’m in the middle of organising next year’s workshops. If you’re interested, do let me know and I’ll put your name on the list. I’ll be heading up to London for the ROI pv on November 27th and then shortly after that I’ll be setting up for my exhibition in Hammersmith with Lesley Dabson from 3rd December. If you’d like an invitation for either of those pvs, do let me know. Long time, no speak. Needless to say, I’ve been pretty busy and not really done many oil sketches lately, just larger paintings for my upcoming exhibition at https://hepsibahgallery.com/ in Hammersmith from 3rd – 9th December with Lesley Dabson. However, in the meantime, I just wanted to let you know that I have prints available for those ‘posting’ Christmas gifts for friends and loved ones in far-flung places. They come signed, mounted and cellophane wrapped and measure 13.5×14 inches all in. They are priced at £55 but as a little Christmas offer, I’m happy to post it out to you or your recipient, free of charge. Can’t say fairer than that! 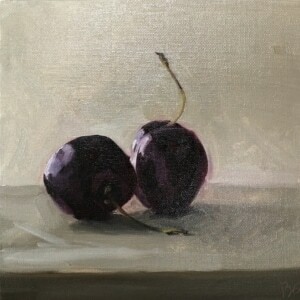 I’ve got some figs staring at me from the fridge so hope to do some oil sketches of those this week. Watch this space! A corner of my room…..
Just a little reminder that I’m opening my studios this weekend and next (including next Friday) from 10-2pm each day as part of the South Northamptonshire Art Trail. Here’s a tiny snippet of what’s on offer. Christmas cards are going fast so do come early if you’d like some. You can find me at Chapel Cottage, Caldecote, Northants, NN12 8AG opposite the telephone box. Just look out for the yellow bunting. 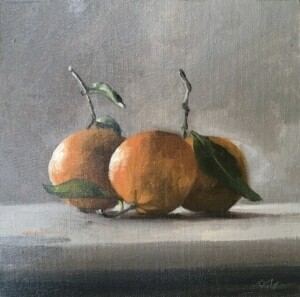 I’ll have original still life and plein-air as well as oil sketches, prints and cards. There are lots of artists to visit in the area too. Hence the name, ‘trail’. Look forward to seeing you. Now……..where did I put those cake tins? ?